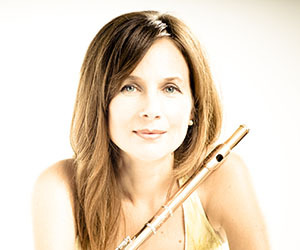 Leslie Newman has held the post of principal flute with the Hamilton Philharmonic Orchestra since 2008 and appears regularly as soloist with the orchestra. Leslie’s performances have been broadcast by radio and television stations in Europe and North America. Her debut CD, Beyond the Iron Curtain, released by CALA/United, was described by Gramophone Magazine as an “…immensely worthwhile contribution to the catalogue.” Her second CD, Opera Fantaisie, was described as “…faultless, perhaps even definitive readings of repertoire from the ‘golden age of the flute’” (Wholenote Magazine). Solo recitals have taken her from the world-famous Wigmore Hall to Taipei’s National Concert Hall, the National Museum in Bogotá, Colombia and Washington’s Phillips Collection. As a chamber musician, she has performed at festivals across Canada and in the U.S., Europe, China and Taiwan. Orchestral highlights include tours through Japan, the U.S., Argentina and Brazil with the City of Birmingham Symphony Orchestra under the direction of Sir Simon Rattle. Recent performances include NoaNoa for solo flute and electronics and the premiere of a new work for flute and vibraphone by Michael Oesterle as part of the Soundstreams series in Toronto and a recital with the Hamilton Chamber Music Society. Leslie teaches at the University of Toronto’s Faculty of Music and Mohawk College in Hamilton.